Darrell Warren with a good Cains River hen. The big news is that due to sufficiently cooler weather DFO opened up the listed cold water pools to salmon fishing on 4:00 PM this past Tuesday afternoon. I don’t know about other parts of the river, but I do know that in the general vicinity of the mouth of Cains, and the main stem of the lower Cains, that there have been a significant number of fish holding in the temperature buffered pools. The opening created the best fishing so far this season, and reported catches of several salmon in a session per angler were common. Catches of grilse and salmon seemed to be occurring in fairly equal numbers both by reports and my own experience. The Black Brook Salmon Club also caught a lot of fresh fish with sea lice. That is something that I personally did not see. At Campbell’s Pools and downriver at Doctor’s Island the water looked great, but we saw almost no fish, and in spite of fishing both areas several times during the past week my total catch was a single grilse from Campbell’s, and that fish was one of the more colored ones that we caught all week. Clearly, though, some fresh fish are coming up the river, and hopefully that will only increase as waters cool. The Millerton numbers through August 15 have been posted, and while not at all unexpected given the relentless warm temperatures that the river has suffered with, the number of fresh fish that entered the river during early August was very low. Darrell Warren preparing to release another nice hen salmon. We have gotten a fair amount of rain off and on over the last month, and the way the systems have tracked across the Province the Cains watershed has received much more than the main river. We found the Cains some mornings this past week running at a moderately high flow, and at a good 2C cooler than the main river. It usually isn’t that much. The brooks were pumping out an elevated and even cooler flow into the pools. On Wednesday morning Otter Brook was running at 12C/54F. The Cains River above where the brook dropped in was at 18C/65F, and 50 feet down river from where the brook dumped in the buffered temperature was 14C/58F. This is helpful to not only the lower Cains River, but must also be attracting fish to areas near the mouth of the Cains. 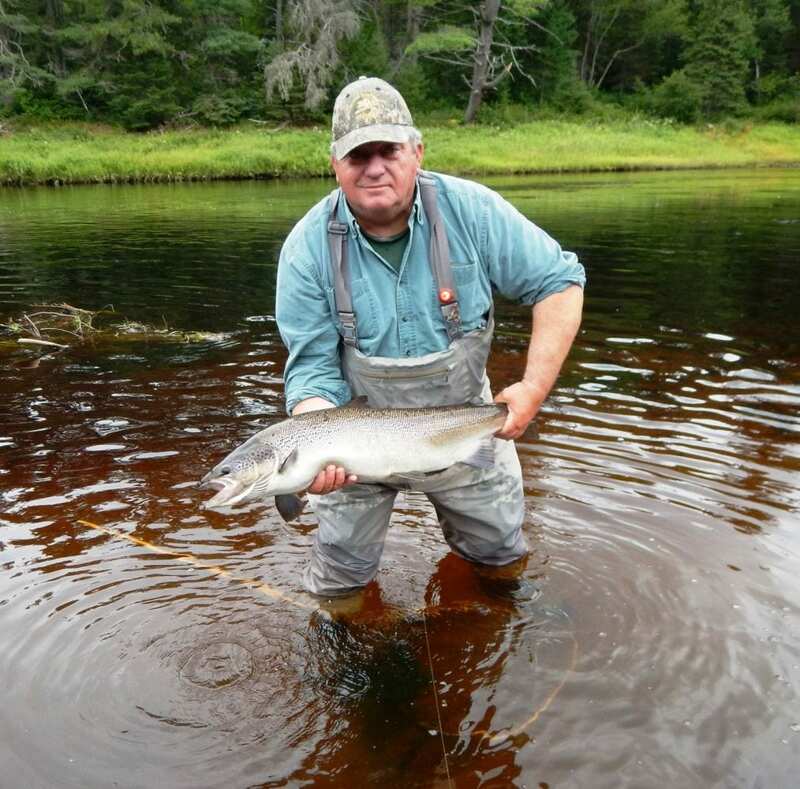 Recently a friend of mine very familiar with the Miramichi and Cains Rivers, and with a background in fishery management, told me that he personally theorizes that the fish that hold during late July and August in the lower Cains River are not Cains fish at all. He thinks the entire Cains run enters the Miramichi from the estuary in the late season. 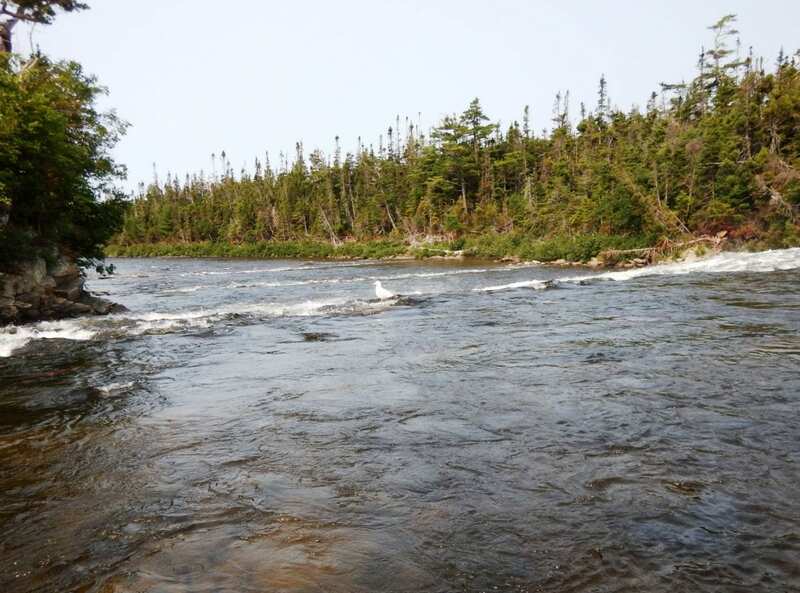 Instead he believes that when temperatures cool the fish holding at Brophy, Buttermilk, Cold Brook, Salmon Brook, and probably Pickard and mouth of Sabbies – all within 6 miles or less of the junction of the Cains and the Southwest Miramichi – drop out of the Cains and back to the Miramichi to ascend that river when waters cool in the fall. It is an interesting theory, and in all the research that I have done on the Cains River for my new book I have not come across any scientific studies that have considered this possibility. The big question now will be just how far the fall run goes or doesn’t go in terms of making up for the extremely weak run year to date. I’ll be at Campbell’s most of the time from the 10th of September on until the end of the season, and I will try to post news on the weather and salmon fishing on a daily basis to the Salmon Report page on my website. Check it out at this web address when you want a little current information. Brad Burns holds a Serpentine River salmon. Guide Paul Rogers standing on right. Lewis Hills from the Serpentine River. Lip of the falls on the Serpentine with numbers 1 and 2 pools visible below. I got an invitation to fish the Serpentine River with New Brunswicker Dawson Hovey, a very active supporter of both the ASF and the MSA. Dawson has been close friends for the last 20 years with Newfound Outfitting owners Ray and Cindie Humber. 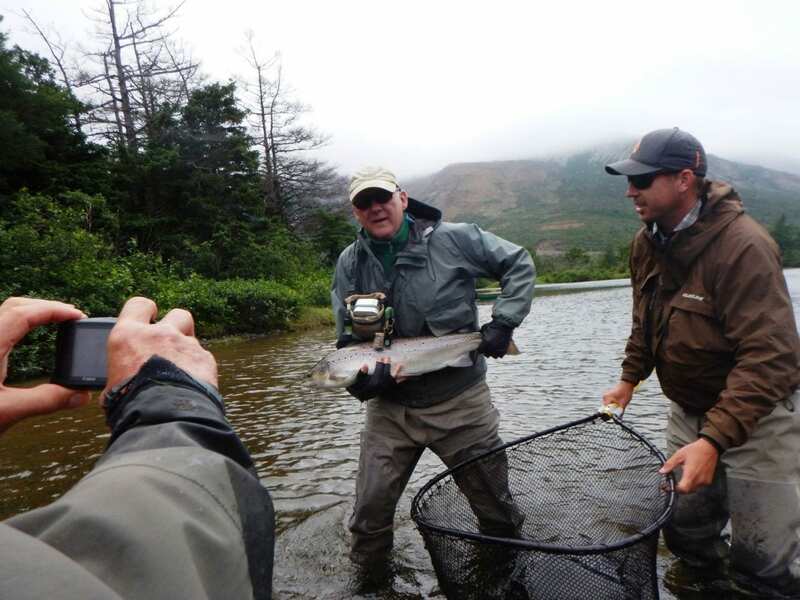 They have a terrific camp for Atlantic salmon and sea run brook trout on the Serpentine River – a river that Lee Wulff helped make famous – about 50 miles southwest of Corner Brook, Newfoundland. Newfoundland and the Gaspe haven’t entirely escaped this summer’s heat either, but the Serpentine’s unique position between the Blow Me Down Mountains and the Lewis Hills, and fed by 600-foot deep and ice cold Serpentine Lake, have kept water temperatures cool all summer long. Guide Paul Rogers walks canoe up a shallow run on the Serpentine. 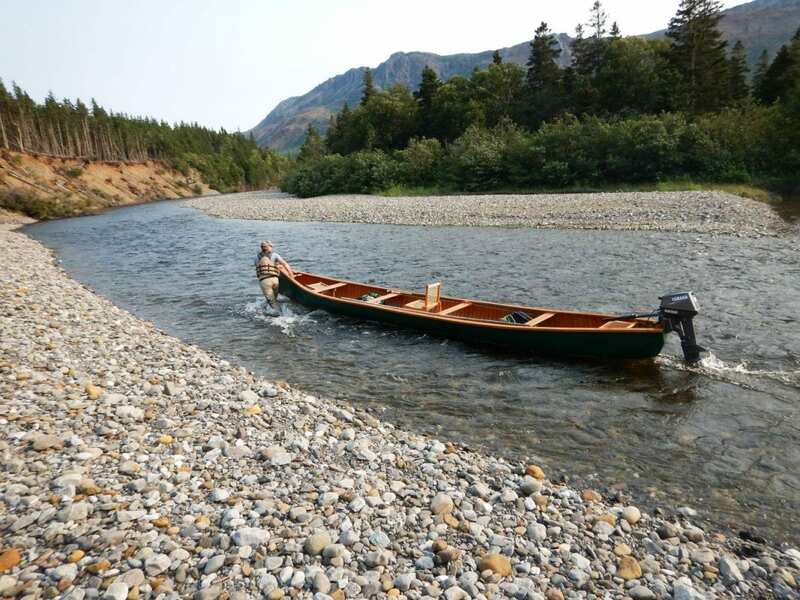 The fishery is unique among those that I have experienced in that while the river is relatively narrow, and only moderately steep, it has deep, sandy and gravelly pools where salmon and grilse are plainly visible in the clear water. Much of the fishing was by dry fly. I was there for the last week on Newfound’s schedule as they need the next few weeks to prepare for their moose hunting season. The river continues to have good runs into early September, even though July is the heart of the season. That is a long season by Newfoundland standards. 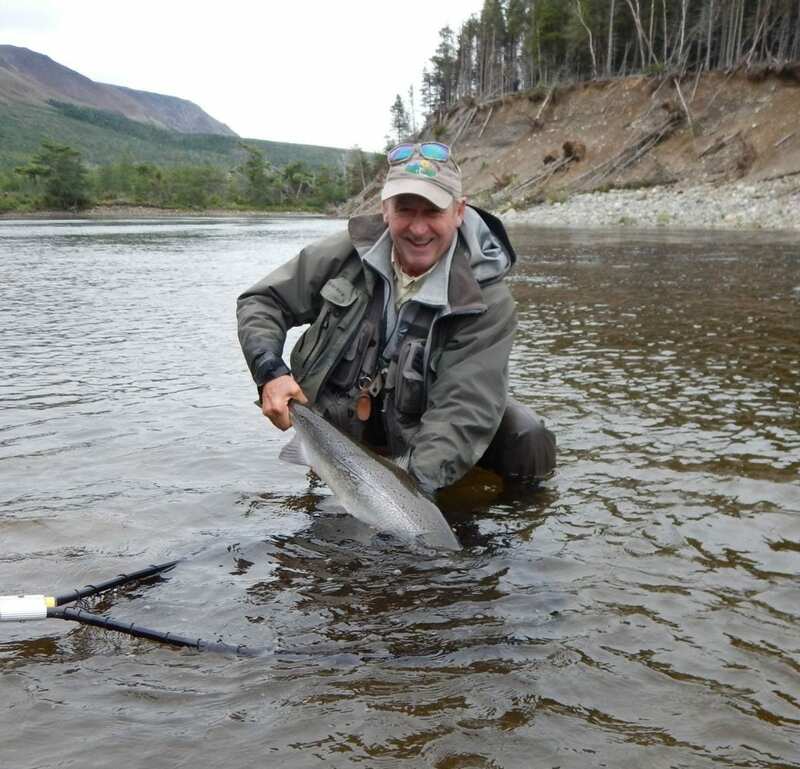 After dinner Ray Humber relives the release of another big Serpentine salmon. 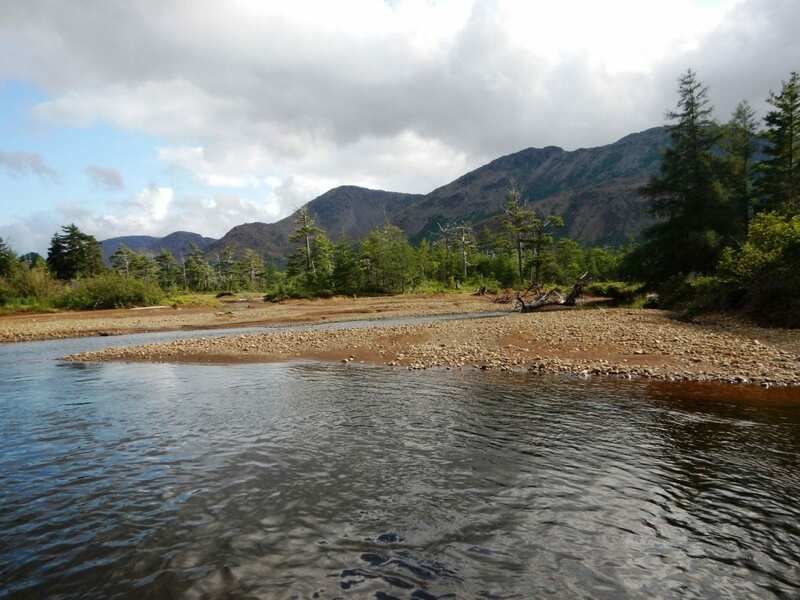 I had 9 fish for 4 ½ days on the water, which is quite good salmon fishing for modern times. 2 were salmon and 7 grilse. I rose and hooked quite a few others that never made it to the net. The action was fairly consistent – I caught at least one fish every day of my trip – and they were taken on both dry and wet flies. Perhaps as much as anything I enjoyed the overall experience. I loved traveling up and down the river in the camp’s 26’, New Brunswick made Lennon canoes. The Lennon’s are unique because they have a beam that is 4 or 5 inches more than even the comparable length Sharpe canoes. There are no roads in this neck of the woods, and mountain views on either side of the valley are spectacular. Cindie’s food was authentic Newfoundland and very good. We had lobster one night, lots of fish, corn beef and cabbage, and even a shore lunch of bottled moose and potatoes. For those who have not had bottled moose I can tell you that lunch tasted very much like the best pot roast you ever ate. 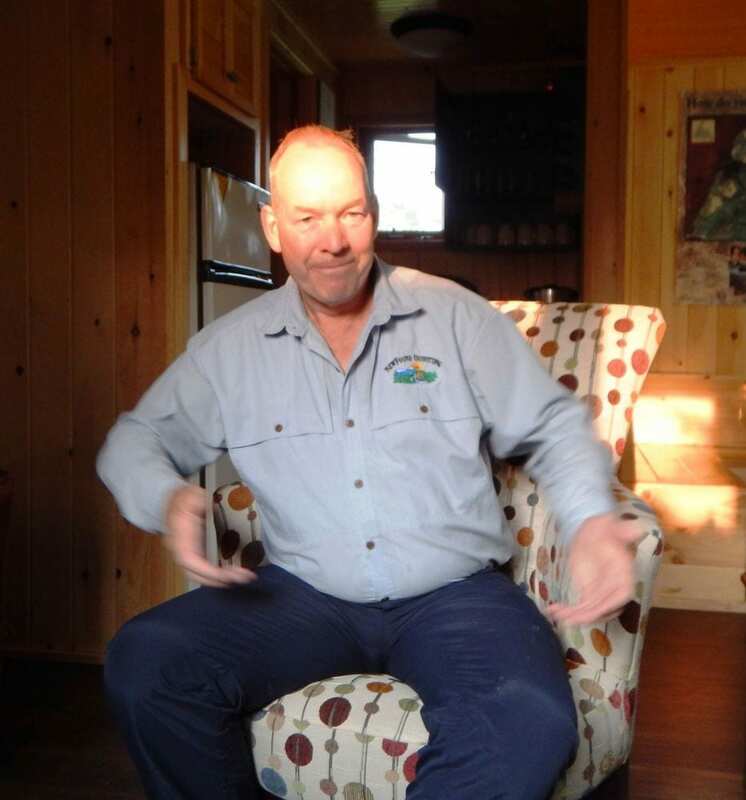 In the evenings Dawson and Ray told some great moose hunting stories including about last year’s trip when they were packing moose quarters out on their backs through a semi-frozen bog that caused them to sink to mid-calf with each step. Dawson Hovey releases a good Serpentine salmon. Below is the underwater video of the release. There are no guarantees with salmon, but all the signs point to a strong run for this fall. That has been the growing trend over the last few years, and summer conditions this year would certainly seem to encourage the fish to wait for fall to enter the river. It is not too late to book some time with Wilson’s, Country Haven, The Ledges, Upper Oxbow, Bullock’s Lodge and other excellent outfitters that I hope will forgive me for not mentioning them. 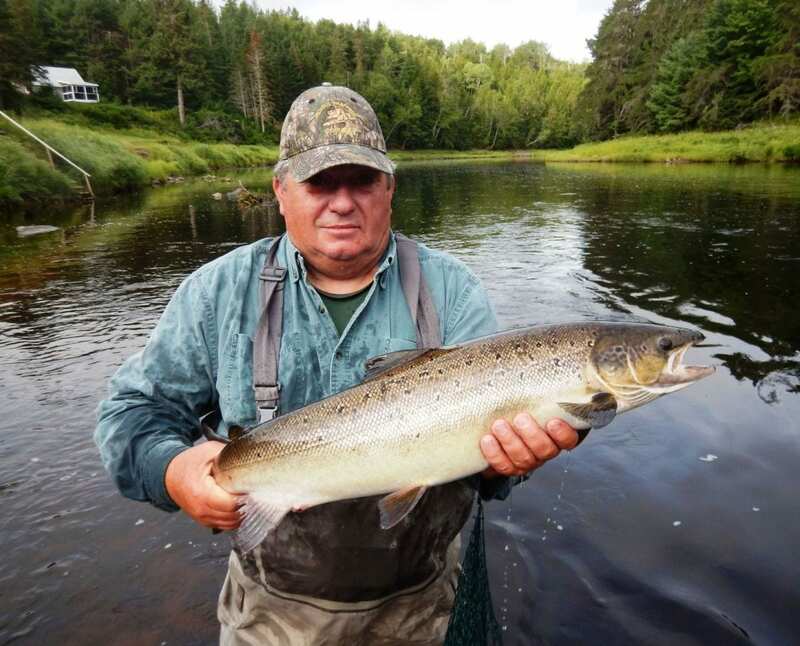 The post August 25th 2018 Miramichi Salmon Blog appeared first on Brad Burns Fishing.